The first shot is only the prelude of the pigeon apotheosis. A couple walks down a street in Rome and a flock of pigeons appears performing a perfect diagonal flight. Good. It is quite artistic but not comparable to the feathered recordings that we are going to find in Venice. 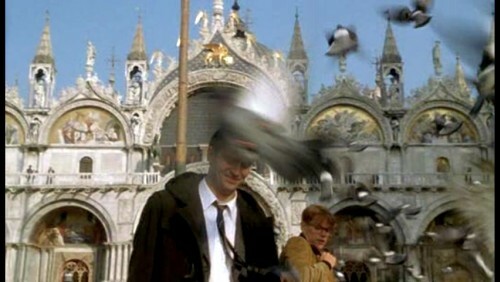 Some minutes later, now in Venice, we see a square completely saturated with pigeons. The flock is engulfing several characters that seem to be too concerned. I think that it is very artistic. I really like the light in this scene and how the pigeon shadows are projected on the floor. 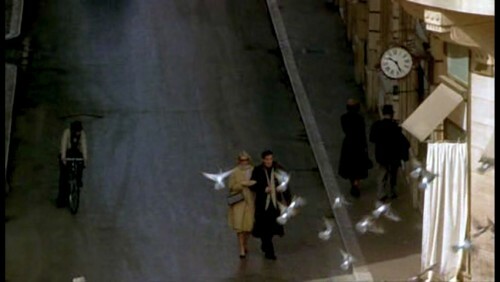 The next scene comes just few seconds later: Mr. Ripley (Matt Damon) crosses this square with a friend of his. It is interesting to see how scared he is. 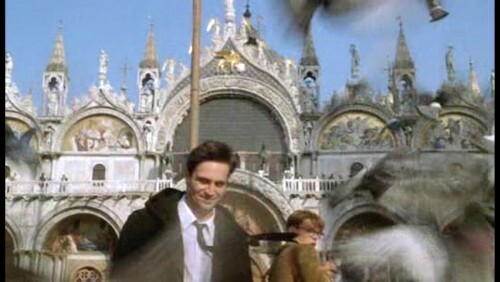 I'm wondering if he was acting or he was actually afraid of the huge flock of pigeons that flies around him. It is also amusing to see the pigeon captured in the first and third photograms. 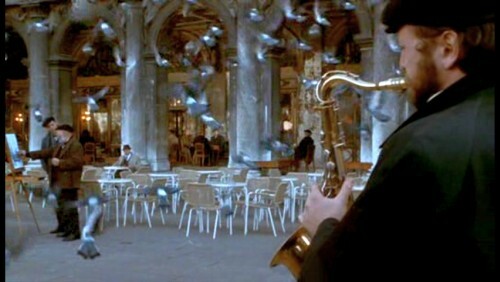 Finally, in the last scene, we can see a perfect example of stereotype abuse: in the same scene we can see a street cafe, a guy playing the saxophone, a flock of pigeons and a 'painter'. A complete overload of Italian stereotypes. 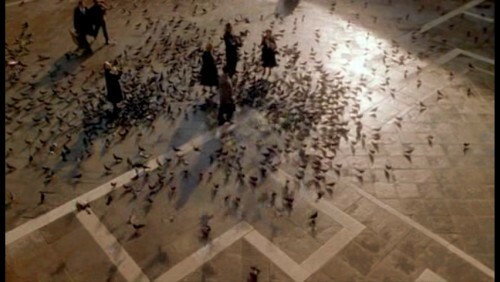 Pigeon activity: These are the typical urban pigeon flocks that roam around streets and squares. Symbolism: Almost none. They only represent common creatures in Italian cities. Relevance: None. Despite their large number, pigeons are only used for creating a familiar Italian atmosphere. No further relationship with the interesting plot of the movie. Training level: High. 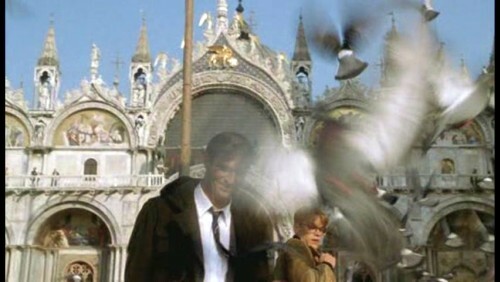 In this movie pigeons behave very naturally, showing an excellent field deployment.